An alumni from the prestigious University of North Texas (BME, MBA), John has embarked on everything percussion from orchestral (UNT Wind Symphony), Drum Corps International (Madison Scouts) to the UNT jazz program (One O’clock Jazz band) and everything in between. A professional music educator/band director in the Dallas/Fort Worth area, John keeps a busy schedule between band/drum line competitions, composing, arranging, recording, performing, adjudicating and conducting clinics. 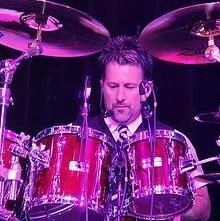 As a professional artist, John has to his credit, recorded/performed with numerous artists, including Torrid Affair (Warner Brothers), Fearless (Independent), Michael Harris (Lion Music), Cheap Trick, The Supremes, Joe Nichols, Vince Neil, Al Green, Sting, landed an audition with Ozzy Osbourne, as well as holding the role of “principal percussionist” in performances of Annie Get Your Gun, West Side Story, Joseph and the Amazing Technicolor Dream Coat, The Phantom of the Opera and most recently, The Music Man. John is not only a performing artist, but also a professional music educator. He has taught in the public sector for almost 20 years, achieving great success at UIL Contest at the State level, “High Drums” Awards (1st Place) at numerous UIL Drum Line Events, won the 2015 NTCA Championship for Indoor Drum Line, has had countless 1st Division Accolades and Outstanding Soloist Awards at the UIL State Solo/Ensemble Competitions and was awarded the 2011 Professional Achievement Award in Education. John has had the honor and privilege of studying with Dr. Robert Schietroma (UNT mallet pedagogy),Ron Fink (UNT timpani pedagogy), Ed Soph (UNT drum set pedagogy), Steve Smith (Journey/VitalInformation), John Riley (Manhattan School of Music), Greg Bissonette (UNT, David Lee Roth, Ringo Starr, ELO), Jim Chapin (Drummer Collective NYC), Dom Famularo (education consultant for Vic Firth sticks/mallets and Sabian cymbals), Mitch Marine (Dwight Yoakam) and Ignacio Berroa (Dizzy Gillespie). John is a certified band director/percussion director at Trinity Christian Academy and percussion specialist at Covenant Christian Academy in Colleyville, as well as a professional recording/performing artist in the D/FW area, directs the percussion class/ensemble “Drummers for Jesus” at First United Methodist Church in Allen, conducts educational lectures/media presentations at TMEA, TBA and PASIC Conventions, State of Texas adjudicator for all UIL marching/concert/drum line performances and All Region/State Band/Jazz Band competitions and is an active member of TMEA, PAS, AMF and ASCAP.